(Courtesy of Perry Bergson, The Brandon Sun) — Daniel Bartek came to Brandon in 2006 armed with a dream of success. The Czech Republic product would find it, but it would come in a way he wouldn’t have imagined at the time. Now 30, and an accomplished entrepreneur, Bartek is thankful for the twists and turns in his road that led him to the Wheat Kings and beyond. He grew up in the Czech city of Olomouc (pronounced awl-mohts), a community of about 100,000 people on the eastern side of the nation. He first skated at age five when his mother took him to an area rink. He didn’t enjoy it much, but after realizing he had improved a great deal, he gave it another try. He started playing hockey a year later, with Czech players such as Jaromir Jagr and Dominik Hasek for heroes. Unlike the Canadian hockey system, young Czech players play in their school grade. Bartek always played at the highest levels — and eventually was moved a couple years ahead to play with older boys — and got some exposure that way. 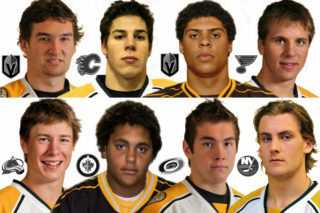 Until the youngsters played midget, they were kept apart from the top levels. He was first noticed at an under-17 tournament playing for the nearby city of Prerov, and had a good season, putting up 36 points in 43 games on an under-18 team. Bartek was actually selected in the 2006 Canadian Hockey League import draft by the Tri-City Americans. An agent had advised him that if he was serious about hockey, he should consider signing up for it. The Americans drafted him, but with three import players in camp, Bartek was sent to the Wheat Kings on Sept. 20, 2006. He said he didn’t really speak any English when he arrived — which is remarkable now because he speaks perfect English with only a trace of an accent — but took language instruction at Crocus Plains in his first year. He took full classes at Crocus in his second year, in part because he hadn’t finished school in the Czech Republic and his family took academics seriously. It was also because he was one of the few European players who had his eye on the WHL’s scholarship program. He would end up graduating from Crocus. Bartek said the transition on the ice was actually much easier, despite his opinion that the WHL is the best junior league in the world. “I acclimatized to the level of hockey very quickly, but everything else surrounding that and the lifestyle and getting used to living in a different country, that took some time,” Bartek said. 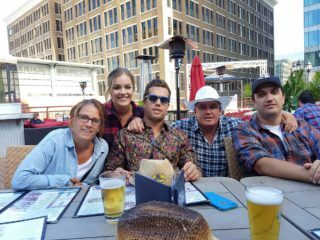 Brandon helped international players to fly home at Christmas, but with his billets away, Bartek decided instead to spend the holiday with Cam Plante’s family to avoid the distraction of flying home. Bartek scored 12 goals and added 10 assists in 63 games in the 2006-07 season, which was his 18-year-old year. He said he was told in Czech Republic what to expect with Canadian hockey, and said it wasn’t that far off. The competitiveness of the teams and level of professionalism of the players were surprises to him. Bartek had the benefit of older players such as Ryan Reaves, Mark Derlago, Daryl Boyle, Andrew Clark and Codey Burki to learn from. He felt the guys welcomed him from the start, and made his experience fun. 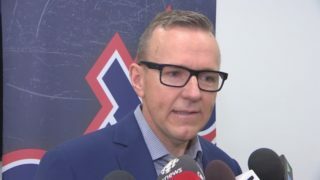 His role proved to be largely defensive, something Bartek suggests came from head coach and general manager Kelly McCrimmon recognizing he had a knack for two-way play. He did whatever he had to that would keep his hockey dream alive. Bartek took advantage of the weight room as much as could to bulk up. In the 2007-08 season, Bartek improved to 22 goals and 14 assist in 54 games, and added three more points in six games with Czech Republic at the world junior championship. Unfortunately for Bartek, he wouldn’t get to spend his overage season in Brandon. Bartek said the deal worked out for the best, with the then four-year-old Everett organization giving him lots of special teams work. He would put up 36 points in 50 games, although he had two surgeries after the season ended. 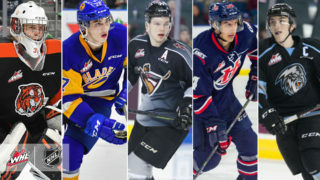 After graduating from the WHL, Bartek made the decision to head to Dalhousie University, bucking the overwhelming trend among European players of heading home. They provided the most work opportunities for him as well, which was important as an international player. But before he got there, the old professional hockey dream roared back to life. The New York Rangers offered him a chance to play at the 2008 rookie tournament in Traverse City, Mich. Despite the recent surgeries, he made a good impression, and was invited to main camp. He was eventually sent to the team’s American Hockey League affiliate Hartford Wolf Pack. It was getting to a point where he had to get to school soon or give it up, but decided the decision would hinge on whether he earned a two-way contract between the AHL and ECHL. In the end he wasn’t offered the deal, and made the life-changing decision to go to school. Bartek played four seasons at Dalhousie, putting up 42 points in 106 games. But his interests increasingly turned elsewhere. It proved to be an outstanding decision. The company he started with friends Cam McDonald and Bobby Besant, Iconic Brewing Co, is still the one he’s working at seven years later. Their first product, under the company name Sage Mixology, was a bottle that kept vodka and cranberry juice in separate compartments and then could mix them in perfect proportions. The trio raised financing for the product and visited the Den in April 2014. They agreed to a $500,000 deal with Arlene Dickinson for a 40 per cent equity stake, but later spiked the project due to manufacturing issues. But the company was still working on coolers, and pitched products to the Dragons’ Den again in March 2015. Michael Wekerle offered $500,000 in return for a slice of profits but that deal also eventually fell through. The company’s offerings now include the Cottage Springs line along with Dusty Boots Hard Root Beer, Dusty Boots Hard Cherry Cola, Cabana Coast Cucumber Gin & Tonic, Cabana Coast Vodka Greyhound, Cabana Coast Moscow Mule and Naughty Otter lagered ale. The company’s goal, Bartek said, is to offer low calorie, low sugar products that dovetail with healthy lifestyles. Bartek is based in Toronto, where he is in a long-term relationship, and he travels across the country for business. He has also become a Canadian citizen.